You've been invited to play the role of XENA ZUMWHERE in Murder at Berryam Stables. A murder mystery set in the fast-paced world of horse racing. World famous jockey Franklie D’Orsy is guest of honour at a party celebrating his 99th straight win. But before his guests can toast his success, he is found dead in the stables, strangled with his own whip! 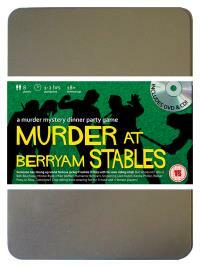 You are invited to join us to help solve the mystery of the “Murder at Berryam Stables”. Society It-Girl (she’ll strike a pose for tabloid photos!) Costume Suggestions : You’ve chosen the littlest black dress from your wardrobe of little black dresses in case a photo opportunity arises. Tall heels also help you stand out as a socialite of distinction. A pink diamond studded handbag and mobile phone give you the essential ‘bling’ look to make it into the current teen magazines and the tabloid press. When people ask me what I do for a living, my reply is always the same: I give other people something nice to look at! I don’t see the point in working when I could just spend Daddy’s money and go to parties instead. I’ve developed quite an interest in horse racing ever since I started dating Franklie D’Orsy.